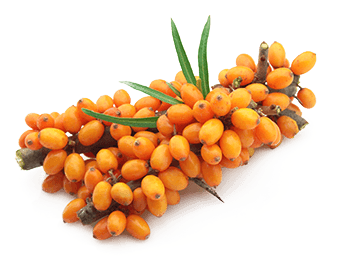 Sea Buckthorn berries (Hippophae rhamnoides L.) are one of the most nutritious foods, containing 10 different vitamins, 24 trace elements and 18 amino acids. They are rich in protein and have a high concentration of some rare essential fatty acids. A German study found that Sea Buckthorn contains as much Vitamin B-12 as liver. It is also on the top list for Vitamin C, Vitamin E, beta-carotene and flavonoid content.